As Doctors started to get a good grasp of using the software, the data within the software started to grow immensely. Some Doctors have entered more than 20,000 patients and 80,000 visits. These were entered by Doctors, all by themselves. This immense data growth presented newer challenges. MyOPD at times was slow to load. Some Doctors started to observe a 3-4 min startup time. Long time was spent loading previous visits of individual patients as each patient would have around 20+ of those. Quite a bad thing when the patient is sitting in front of the Doctor. Heavy users started reporting such issues and these needed to be addressed. The good part is, MyOPD is an ever improving Doctor software. We regularly keep on releasing enhancements based on feedback from our community. This results in a software that works smoothly, without hiccups. Doctors can then focus on what they do best – Management and Treatment of patients without worrying about the Software. 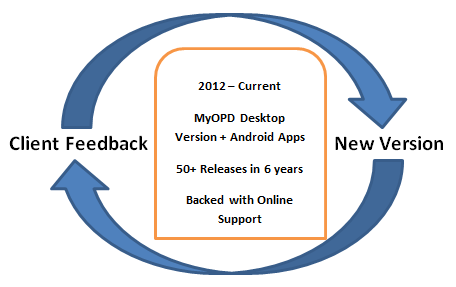 Plus, MyOPD is not just a Windows based Desktop software. We improve all the connected Android Apps over team to provide our Doctors a great technological experience while using MyOPD Clinic Software.